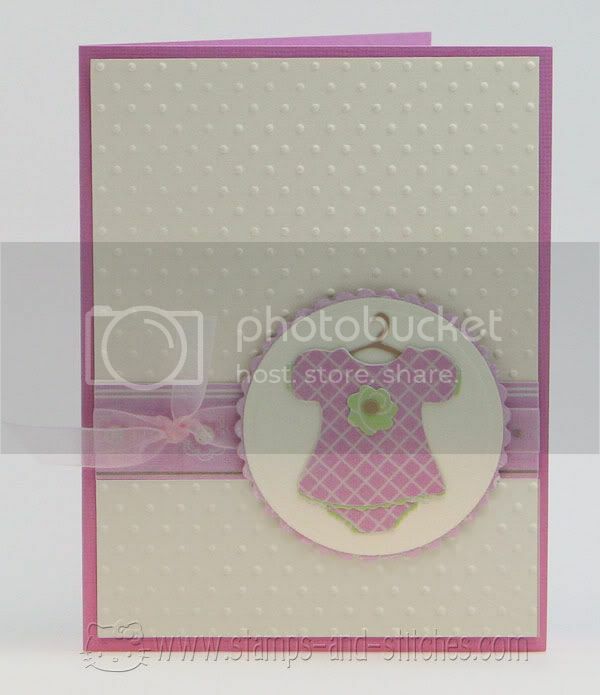 I made this quick card for the daughter of a friend of mine-she just had her second baby. I cased this card from bigsky at SCS. You can see hers here. I had to change it a little because I didn't have the right colors of ribbon. I made the outfit on the cricut with the new arrival cartridge and the circles are cut with nestabilities. Paper is: Imaginisce, Stampin Up, and Bazzill. I think the ribbon is Stampin' Up organdy. Swiss Dots cuttlebug folder. The color came out funky-I need to use my light box in a different place I think. 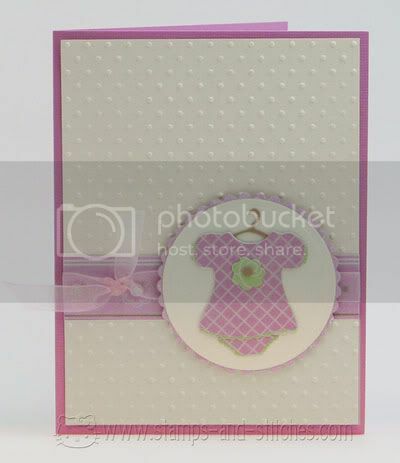 The light color cardstock is Stampin' Up Vanilla cardstock. Oh this is so sweet! Why don't I think of using my Cricut for cards? It looks difficult...are you sure it was easy?? How cute! I love the polka dots with the scallops. This is so cute. I love the dotted background, the ribbon, the onesie, I guess all of it. Super cute! Cute! That little dress is so darling!